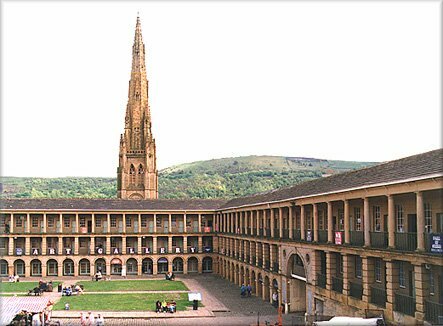 Perhaps the greatest jewel in Halifax is the Piece Hall, the only surviving cloth hall in Yorkshire and covering 10,000 square yards. This, opened in 1779, was the market for local handloom weavers and merchants who brought their pieces of cloth for sale here. Boasting 315 rooms, the Piece Hall replaced the previous cloth hall, the Blackwell Hall, whose capacity had been outstripped by the growth of the local textile industry. A market was held at the Piece Hall every Saturday between the hours of ten in the morning and half-past two in the afternoon. John Holdsworth, grandfather of John Holdsworth who founded John Holdsworth & Co Ltd, a cloth merchant from Shibden, was one of the first tenants, with Room number 12. Around a central quadrangle are galleries with Tuscan and Rustic columns accommodating 315 lock-up rooms. After the Industrial Revolution had left the Piece Hall stranded like a beached whale, it was allowed to deteriorate physically and in the 1970s was on the verge of being pulled down. One vote saved it! Can you believe what philistines the civic authorities were in those days? Now the Piece Hall has new life as a museum and gallery with shops selling antiques and collectables and the central area is used for concerts. Again it is appreciated for its distinctive beauty and at the same time it has a purpose. It is, of course, now a listed building. It was so nearly a pile of rubble. The song was a celebration of a building opened on January 1, 1779, devoted to the woollen trade which was the source of Halifaxs prosperity. The Piece Halls 315 rooms would be occupied by clothiers who would bargain with handloom weavers who came to town to sell their pieces of cloth. Before long the Industrial Revolution would make this way of doing business outdated. In 1868, less than a hundred years after its opening, the Piece Hall was handed over as a gift to the corporation. In the 1890s the building was turned into a wholesale fruit and vegetable market. But during the 19th century it was often used for communal activities which dwarf anything that takes place in modern Calderdale. They were the Halifax Sunday School Jubilees, the famous Sings, which began in 1831 and continued every five years until 1890, only skipping 1851.